When I wrote this, I was thinking about: bbc, Usability, Web Design. Over the last few days and weeks the BBC have been rolling out a fairly major redesign of their web presence. This all started with the Home Page Beta, followed by the actual new homepage, and is now continuing unabated across all their web properties. This week saw this new design reach the news and sports pages. There are some real triumphs in the design, but there are also some really surprising oversights. There’s also a lack of consistency between sections of the site. One of the biggest changes has seen the width of the site increase. As a user or a widescreen laptop, this is a welcome change. This new, expanded, design should have opened the door for the designers to better fit the content to the space, however, this hasn’t really happened. There’s been lots of talk in the BBC Blogs about the new design embracing multimedia, allowing for larger, higher quality images and videos to be integrated with the content. At this moment in time, this is being done badly. 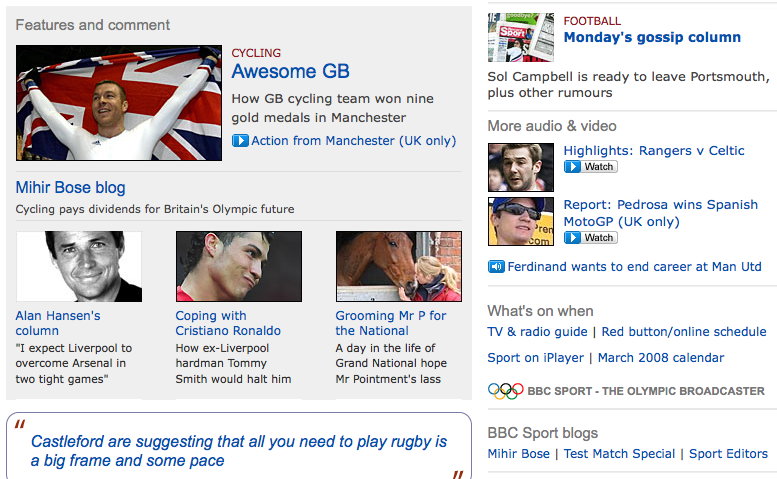 Take, for example, the current Sport Homepage, pictured to the right. 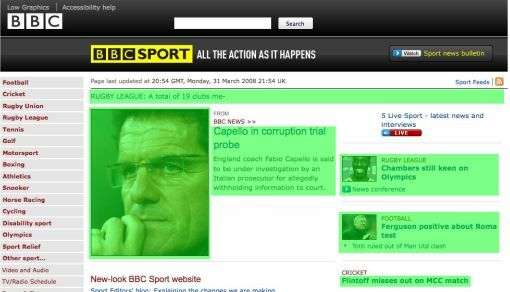 There’s a fairly dominating picture of Fabio Capello in the centre of the screen, with very little actual content above the fold. One of the strengths of the old section pages, especially the sport section (which I happened to frequent regularly), was the amount of high level information that could be garnered from the “above the fold” area of the page. I don’t mean to harp on about the sport page, but I do think it’s by far the worse of the redesigned pages. One of the issues I have with it is the use of white space. Now white space is clearly an important element of web (and print) design, and one of the BBC designers has clearly heard that on the grape vine. Unfortunately, they haven’t quite grasped the aesthetics of a web design that utilises white space effectively. More importantly, much more of this information is content, rather than blind links to various areas of the site you could have just as easily bookmarked, adding greater value & utility to the audience. Ok, that was a comment about the redesign of the home page, but it’s such a lofty goal it should really be applied across the board. To see how the sports section page stacks up, I’ve highlighted all the actual content in green. And I’ve been kind. I’ve highlighted the images that have been added with each post, even though they may very well be generic stock images and certainly don’t add anything to the story. As you can see, it fails by their own metrics. Fonts, Type Faces and Weights, Oh My! Going hand in hand with the redesign has been a fairly major rethink of the fonts used. I was previously in the camp that thought the fonts used on the BBC site added to it’s overall dated look. A refresh of fonts is certainly welcome. This is one aspect of the site design that I think is mostly successful. The new, or refreshed, fonts look cleaner and on the whole are more readable. There some exceptions, the fonts in red seem particularly difficult to read and need to be a bit weightier and, once again, the sport section lets the side down by using an awful mismatch of fonts throughout the page, which just adds to the general shabby, confusing, unstructured look of the page. Considering the care that seems to have gone into choosing the fonts for the homepage, the complete lack of care taken on this page is surprising. Possibly the biggest change of all has come in the shape of the new BBC Home Page. They’ve taken a similar approach to services such as Net Vibes, with a modular approach and customisable content. It’s a bit of a walled garden however, with content being taken purely from the BBC and no option to add anything from other contributors. This isn’t perfect, and it prevents it from being a true alternative to something like Net Vibes. There are a couple of things that annoy. As I mentioned above, there’s no way to add the content you really want. This extends to the TV and Radio modules. So what would be a useful tool, a list of what’s currently on TV, instantly becomes much less useful because you only get the listing for the BBC channels. I’ve also noticed that if you rearrange the content boxes, and then add a new one, the arrangement you’ve chosen is completely lost. it’s not as if the new box is added to the top of the stack, moving everything else down, because its not. It seems random. There is also a fixed element to this otherwise customisable design. A featured, or promo area, located in the top right of the page is fixed and cannot be removed, moved or resized. This has been much discussed in the BBC blogs, with a need for an anchor to the page being referred to. I don’t buy this. Surely if the user needed an anchor to the page, they could leave the promo box there. Personally, I don’t want or need an anchor, and the homepage service I actually use doesn’t have one, yet still works fine from both a functional and aesthetic standpoint. There were also claims that it will be used to push content other than promotional material. This isn’t currently happening. I can understand the BBC’s wish to remain in control of part of the page, but it just serves to emphasise the fact that they are only half embracing the Web 2.0. It’s the difference between a transvestite and someone who actually goes through with the op. There are some real successes. The effort an consideration that’s been put into validity and accessibility is truly exceptional. Probably the best I’ve ever seen for a page of this type. And let’s not forget, making dynamic content accessible is very very difficult. There’s also a nice layout to the page. Fonts have been chosen well and the colours are user-selectable. Each content box is spaced nicely from the next with enough room to breath, but not so much as to make it appear unduly sparse. I think the redesign is very hit and miss. Some strange style decisions have been taken and there’s a lack of cohesion between the various “sub-sites” or sections. There’s also a feeling that they’ve held back a bit, not fully committed to the ideas that were driving the redesign. It feels like the sort of project where the engineers brainstormed a really sleek approach, only to have the manager curtail it because they’re a bit out of touch. A bit uncommitted. There are some points that need to be addressed. Some of the layouts don’t quite work, some of the text is a bit difficult to read (all down to colouration and weight choices, easily fixed but should never have been released as is) and parts feel only half implemented (which, in their defence, they are). There also seems to be less adherence to the strong grid based design that was such a dominating feature of the old design. It’s still there, but not as tightly implemented. Which for me, is a shame. For some inspiration, I’d love to see the BBC looking around the web. Trying to get a grasp on the trends currently out there. For my money, people like adii with his Premium News WordPress Themes are at the cutting edge of laying out news on the web in an attractive, organised way. By the way, adii is currently having a competition where he’s giving away a developers package of the Premium News Themes. You’d get all 7 themes, including the Gazette Edition, my personal favourite and one I’d love to use. The reason I mention that, and especially the gazette version, is that, in my opinion, it does a much better job of laying out content than the newly designed BBC site. It seems to embrace all the ideals the BBC set out with but manages to achieve them in a much more pleasing way. There are 3 responses so far. View them below and add your own using the form at the bottom of the page. Even in your case where the content is in white but the area around is green – I do similar designs but somehow I done like them so much personally as full white – whats your take on this? Rajat – I think allot of things in the world of design are down to personal preference. It’s why designers do multiple mockups of designs, each a different to the other as possible. You never know what the client is going to take a fancy to. This is especially true of colours. I like the green on this site because you don’t really see that many green sites. Most tend to be either white or blue. Of course I have completely different goals to the BBC. This site needs to stand out, where the BBC site needs to do the complete opposite. “White Space” is generally referring to the space between content as opposed to actual space that is white. On this site, it happens to be green. I think even if the BBC site was a different colour, the (white) spacing would still be an issue. You need a certain amount of white space to make designs inviting and readable. But if you have too much, it breaks up the flow of the page and makes it look unduly sparse. I think the site is very good, however somewhat confusing to navigate. I do love the fact however you can move the content boxes around and add and remove areas of interest to you.